Mon petit coquettes, it is no surprise that behind every handbag in one’s collection is a harrowing tale of how we brought such an accessory into our lives; but just as there is a story behind every acquisition, there is also a tell-all behind every creation – just ask Marcia Sherrill. Years ago, Marcia and her husband created Kleinberg Sherrill, a luxury handbag collection that was carried in major department stores the world over and received write-ups in every publication from Vogue and ELLE to W, The New York Times, and Women’s Wear Daily. After a torturous divorce, however, Marcia was left a penniless pauper as opposed to the pretty, pretty princess with a penchant for purses she once was. ♥CF: What is the inspiration behind collections such as the London Series, Fifth Avenue Series, and Palm Beach Series? Marcia: I am inspired by places and people, on both broad avenues and narrow alleys. People everywhere. Each series of bags is designed with women in mind, doing all sorts of things. I want to make the bags both functional and beautiful. ♥CF: Do you build your outfits around your handbag, or put together an outfit and then choose which handbag would look best with it? Marcia: I can’t help myself, I am a Bag Lady, so for me, it always starts with the bag. Right now, I have a new red bag and no one has seem me in anything but black for a year, so I am changing it up and going bright with the new bag and a fabulous new attitude! A good way to live your life! ♥CF: If you were to buy five things right now, what would they be? Now, as a way to truly introduce her new line to the world; Marcia is being so kind as to bring one (1) Café Fashionista reader the Small Deenie Bag in Black (valued at $90.00) from the Fifth Avenue Series. 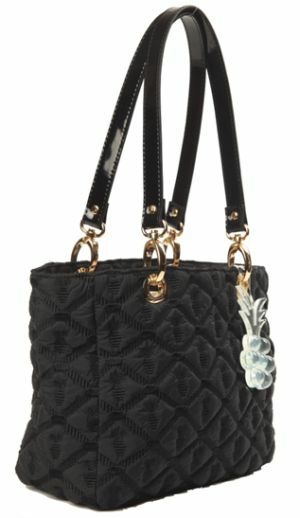 ♥For one (1) entry, leave a comment on this post stating what Anabelle by Marcia Sherrill bag is your favorite between now and Friday, December 10, 2010 at midnight PST. ♥ For two (2) entries, Twitter about this giveaway, and leave a comment on this post stating what Anabelle by Marcia Sherrill bag is your favorite between now and Friday, December 10, 2010 at midnight PST with your Twitter URL. ♥ For three (3) entries, become a follower of Café Fashionista on Blogger/Google Reader/Google Friend Connect/Twitter, and leave a comment on this post stating what Anabelle by Marcia Sherrill bag is your favorite between now and Friday, December 10, 2010 at midnight PST (if you are already a Café Fashionista follower, please say so in your comment). I will randomly pick one (1) name out of a hat (who knows, it could be yours! ), and announce the winner on Saturday, December 11, 2010. Thanks to Anabelle by Marcia Sherrill for the pictures. Fab interview and giveaway, darling! I follow on GFC and Twitter. not only is the bag divine but it's also my middle name!! nice giveaway! i definitely need a new bag so this is perfect. i follow via friend connect & bloglovin. and twitter. my fav. bag is the Lena tote. This is totally amazing! Love it. A great post! Happy Black Friday! Great interview and I love the bag. I am a follower on Google Reader and Twitter! this bag looks amazing! Thanks for the chance. The Large Francesca bag is my favorite. and this is such an awesome giveaway! I've been looking for a fashion blog to follow for awhile, and your blog is awesome! I just became a follower using bloglovin' and I'm excited for your future updates! Hope you had a fantastic Thanksgiving! Sounds like my kind of line! I kind of like the Large Patricia. I'm also a Blogger Follower. This was such a great interview. I'm sure you were so honored to interview Ms. Sherrill. I hope you have a terrific Thanksgiving, E.
They are all amazing bags but the Large Deenie caught my eye and needs. Awesome interview! How beautiful these bags are. I love Larissa bag, enter me please. Following via google, as fisiwoman. This was SUCH a fantastic interview. She's evidently super passionate about what she does, which I always find very inspiring! You always have such great giveaways and what an awesome interview! I have to say that I am loving the little pineapple! What a fun touch! I love the HILARY bag, perfect for work! And I really like the Large Patricia. I love the Large Patricia bag! Lovely giveaway! I'm already a follower, and my favourite bag from the website is the Fran. Fabulous giveaway! I love the Medium Francesca! I've followed you ! Happy Thanksgiving Erika ! Great interview! And this is a lovely bag... Happy weekend! I loved that bag! It's elegant with a twist! And Deenie is the way one of my friends call me, wo when I read that I thought "ooohh, made for me!" Have a great weekend! Great interview. I enjoyed reading. wonderful post. i'm actually loving the Deenie bag you posted here. i already follow you through GFC. This bag is absolutely divine...it's a classic with a modern vibe. It is something every girl should have hanging in her closet...a definite staple piece of anyone's wardrobe!!! My favorite is the Large Susan Bag, and I already follow you. I already follow you via GFC as nightowl. I like the Small Susan Bag in the pink. 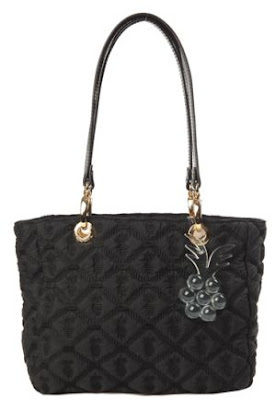 1st entry:- I love Sonya Belle bag from Anabelle by Marcia Sherrill. The "Large Sophie" steals my attention! I've JUST tweeted about this! Wonderful interview! I think the Dita bag is my favorite. I follow on Twitter. Great interview. I love the large Deenie Bag (in pink). It spent the summer at the beach with me. Marcia's bags are so much fun!! This is a fantastic giveaway!!! I woudl have to pick THE DITA bag - black, sleek and fabulous! What a fun giveaway! love the Beth.. practical and colorful in a field of all-white clothing! The Large Susan is Darling!! I am cutting it close i see! My favorite is the Small Corinne..it reminds me of a purse I made for myself in high school that I thought came out really nice but this one the colors are beautiful and i love it! my favourite is the small deenie bag in black because its so friken cute!